A worthy place to stay in the Coron. 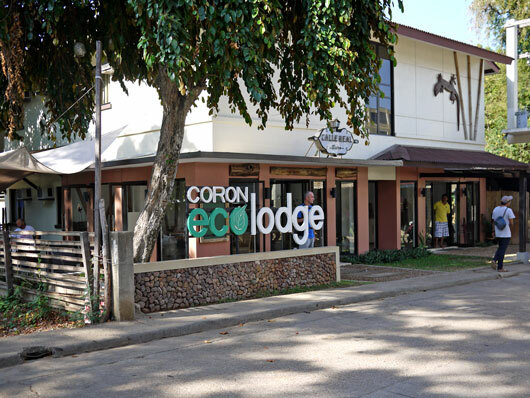 Another new experience for us was our stay in Coron EcoLodge, a new boutique hotel situated near the public market, church, municipal hall and public plaza. The exterior of the two-story hotel is beautifully designed as well as the interior. The room are cozy and has cool ambiance. The staff, naturally warm and polite. 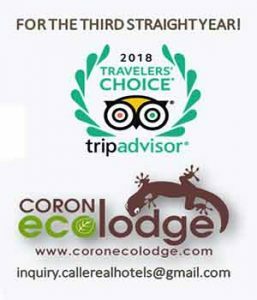 Coron EcoLodge is truly a worthy place to stay in the Coron. We took the Coron Island Tour package from Coron EcoLodge. If you’re new to Coron and has only 2 nights to spare it’s a good tour to take as it visits the key sites in Coron like the Kayangan Lake, CYC Beach,Twin Peaks Reef, Atuayan Beach and the Coral Garden. Our day started not too early as we were at the pier by 9am. We found out that the other group that were supposed to be with our boat won’t be able to come. Instead of whisking us to another group, our tour pushed through with the boat all to ourselves. My trip to Coron, Palawan last September was very different from the trip I made back in June 2008. That, for me, felt more like a backpacking trip, the trip this year feeling more like a holiday. The accommodating staff of Coron Ecolodge and Floating Restaurant and Zipline ensured our stay in Coron was hassle-free and enjoyable. Coron Ecolodge is the hippest budget accommodation you can find in town. After a hearty Filipino lunch at Lolo Nonoy’s and a quick nap, we geared for the first adventures of day 1 organized by Coron Ecolodge. Aboard a comfy van we toured the quaint town before taking on the 700-plus steps to the peak of Mt. Tapyas to witness what was to be one of the most beautiful sunsets I’ve seen in my life! I admit that climb was no mean feat, left me gasping for air. But it was the panaromic beauty of Coron that took my breath away. We booked online for a 3 night stay at the hotel. We took the 2GO ferry to Coron and realized we would arrive 4:30 in the morning which was way too early for the hotel’s normal check-in time. I had a bunch of questions about transportation from the pier and early arrival so I contacted the hotel. The hotel manager promptly emailed me a response and answered all my questions. There was no guarantee they would be able to accommodate us early but luckily for us they were able to when we arrived. The hotel is very well managed with friendly, young staff. The hotel itself is a little worn down which seems to be the norm in Coron but very clean. Breakfast is included but could use some improvement. They also serve coffee, tea and water all day. The location is on one of the quieter streets in town and walking distance to most of the restaurants and amenities you would need. Overall, I would say it is great value with some of the best staff in town. We ended up extending our stay to almost a week in March and it was almost always fully booked the time we were there. There is a number of hotel and pension houses around and within downtown. What attracted me most was this Coron Eco Lodge located at Calle Real. The name of the street is too personal for me because it is my family name. I must say it has influenced my choice but it doesn’t end there. On top of that is the excellent service they offer which every guest would always appreciate. The staff were friendly and accommodating. Also, they could help you arrange tours and transportation, which makes it even more convenient. No doubt, Eco Lodge is a strong preference for a place to stay in Coron. Oh by the way, You can easily distinguish them by the famous symbol they use, the lizard, which I believe is a common wildlife in Palawan.